Creatinine is basically the waste chemical product of our body. When our muscles get metabolized and perform their metabolic function, then they produced creatinine in our body. The creatinine is the major product of Creatine. It helps in our body for the production of energy. Our body produced so much amount of creatine which provides energy to muscles and only 2% can be converted into creatinine per day. Creatinine is pass through the muscles and goes into the kidney. The level of creatinine in our body describes the proper functioning of the kidney. Basically, our kidneys help to reduce the level of creatinine in our body by purifying it. If the level of creatinine in your body is high, then it shows that your kidney is impaired and not working properly. The main function of the kidney is to filter out the creatinine from body with urine. The average level of creatinine in an Adult male is 0.6 to 1.2milligram (mg) per deciliter (dl). In adult females, it is approximately 0.5 to 1.1 milligram (mg) per deciliter. In the old aged person, the level of creatinine is less than normal. In infants, the level of creatinine depends upon the muscle development and it is approximately 0.2 mg per deciliter. If a person has only one working kidney, then his/her creatinine level may be normal up to 1.8 to 1.9 mg per deciliter. The person having a high level of creatinine in their body, feels dehydrated. Swellings in legs, feet, and hands which is basically due to the accumulation of unwanted fluid in the body cells. Infection in your kidney can also elevate the level of creatine in the body. There are some supplements, medications, and foods may also increase the level of creatinine in the body. Due to heavy exercise and by consumption of lots of proteins in your diet can also increase the level of creatinine in a body. A person suffering from diabetes can also have this problem. We all know that kidneys help to remove all the toxic substances from our body. If your kidneys are not working properly, then it will lead to high level of creatinine in the body. Creatine is basically a chemical waste produced by our muscles. In the severe cases, doctors recommended dialysis to the patient. The high creatinine may cause severe damage to your body. There are so many Ayurvedic herbs for the treatment of high-level creatinine in the body. All these herbs help you to reduce your increased creatinine level by the natural way without any side effects on your body. Gokshur (Tribulus terrestris) :- It helps to maintain the diuretic activities in your body. Bhumi amla (Phyllanthus niruri) :- It has anti-inflammatory, anti-cancerous property. It is a very good blood purifier and shows carminative action on your body. Shigru (Moringa oleifera) :- It has also a very good anti-inflammatory property. And use as to improve the blood circulation in the body. Apamarg (Achyranthesaspera) :- This herbal plant is used to reduce the acidity of urine and helps to solve the problem of renal dysfunctioning. Varuna (Crateva nurvala) :- This herb acts as an anti-inflammatory, and also helps in diuretic issues in the body. It cures the urinary tract infection and renal stone problem. Kaasni (Chicorium intybus) :- It acts as a very good alkalizer. These herbs provide the strength to your kidneys and treat the nephrotic disorder in patients. 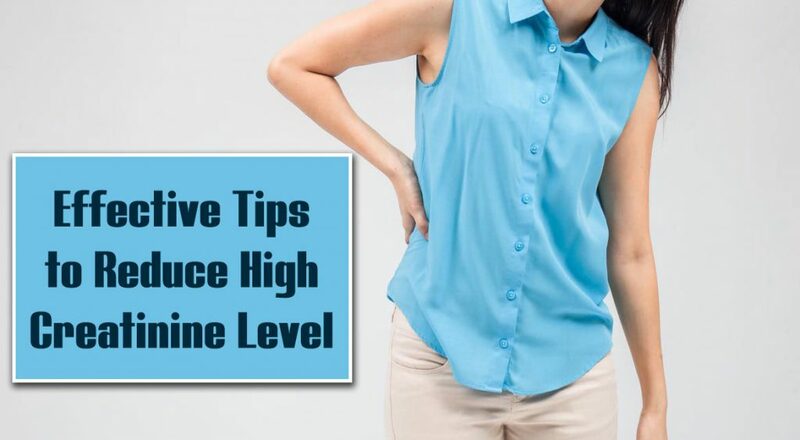 If you have a mild range of high creatinine, then you can reduce this level of creatinine from your body by simple home remedies. Dandelion Root :- It’s a very good herb which helps to reduce the creatinine level in a body by flushing out the toxin. It’s a natural diuretic. You can use the powder of Dandelion root and take it with hot water for a few days for better results. Cinnamon :- It can help to improve the renal filtration ability of kidney, and also improve the kidney functioning. In diabetic patients, it helps to maintain the blood sugar level. So that, there is no further kidney damage. Corn Silk :- It is also a natural diuretic, which acts as an anti-inflammatory agent. It helps to remove excess urine creatinine from your body through urination. Tinging Nettle :- It helps to improve kidney functioning and remove all the waste from your body and also help in blood purification. Siberian Ginseng :- It’s a very good energy boosting herb which ultimately helps to promote renal circulation and improve the proper function of the kidney. Avoid supplements containing creatine because creatine is ultimately converted into creatinine. So the level of creatinine increases in a body which is not good for you. Avoid heavy Exercise because due to heavy exercise muscle metabolism can be increased and finally, it produce creatinine in the body. Reduce the intake of proteins from your diet. You should avoid all the processed food. Exclude red meat, burgers, patties, noodles and other fast foods from your diet. You should eat more vegetable-based products and foods. Avoids packed and processed products because these may contain creatine which ultimately converted in creatinine. Water intake can also decrease your creatinine level because dehydration in the body can also lead to an increase in creatinine level in the body. But you should take the recommended amount of water. If you are on dialysis, then avoid drinking lots of water. You should opt for a special diet to control your increased creatinine level. Avoids all the foods which contain sodium (such as table salt), potassium (bananas, broccoli, spinach) and foods contain phosphorus in it like fish, soybean, and pumpkin etc.